The last couple of days had been really warm here, almost felt like mid-July. Not that I don't like warm days in New England when we always complain about the long winter. Yesterday the temperature dropped to a little chili. Feeling of the Fall is always wonderful. I felt like as if I am in India, Assam my home state. Felt like waking up in the morning walking on the lawn barefoot, foggy and hued and with all the festive buzz around. Now I am in New England, missing Indian festivities, so thought of posting a custom made Mekhela Chadar grey and orange, which I got from Assam when I visited last time from Xipini By Kanishka Gogoi Mahanta. A very contemporary appeal with a traditional touch. I accessorized it with antique finish gold jewelry. The outfit is ideal for both day and night. Also, the melange of the two colors, the brightness of orange and mildness of grey portraits the balance of fall between summer and winter. As you all know, how I make so many trips in my mind, back and forth from Connecticut to Assam, my thought of making a bridge between Fall and Dussehra connecting the two cultures. Today is Dussehra a major Indian festival. I love the significance of this festival, win of good over evil, associated with the great Indian epic Ramayana, where prince Ram's homecoming with the glory of winning good over evil celebrated. Let the good be the winner in our lives and love over hate today and every day. Happy Dussehra and happy fall folks! P. S. Mekhela Chadar is an Assamese ethnic outfit. 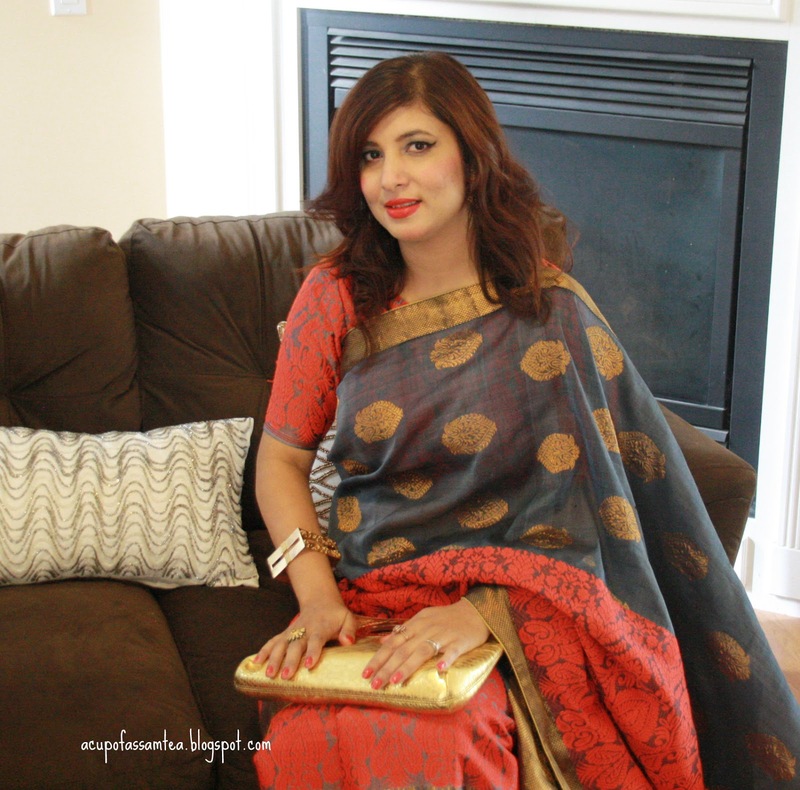 It can be easily disguised as a saree. 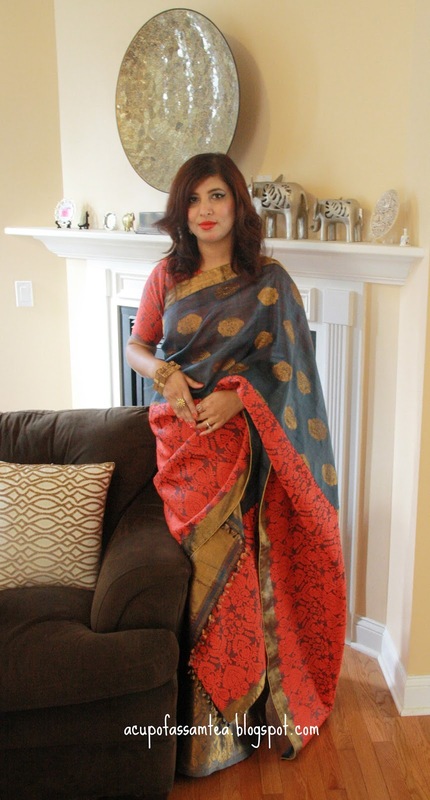 Saree is one piece of attire, and mekhela chadar is two-piece, a skirt(mekhela) and scarf(chadar). You look absolutely gorgeous! Happy Dasera to you too. Very beautiful, I love your outfit. It looks so elegant and pretty. Your weather also sounds lovely, we're already into rain and gloom in England. Happy Dussehra to you! Your are stunning & the outfit is gorgeous! Love the idea of bridging two cultures together to create a new look. You look stunning! Gorgeous.Its a brilliant idea to merge two Cultures together. I love the melding of cultures and your post has some great information! Your outfit and your style is stunning! Beautiful outfit! I love the colors and the intricacy of the fabric! Wow!! What a beautiful outfit. It's a great idea of bridging two cultures together. Such a beautiful and informative post, thank you so much for sharing! The colours of this outfit are stunning. They look great on your skin tone. I love your Mekhela Chadar. Those colors just look vibrant on you. The colors are striking and I love how it looks on you. Perfect for the transition from Fall into Winter. Gorgeous. Wow, I haven't heard about such material. So cool. I enjoy stories about bridging cultures, and you have a way of showing it so elegantly in your clothes. I love the color combination. I love your outfit ! Really beautiful and bright colors, it is so elegant! Happy Dussehra to you as well. This is a very beautiful outfit you came up with! I'm really into the bold colours and patterns on your clothes, so so pretty !! Such a beautiful outfit. I love the brightness of the colors and unique subtle beauty of the print! I love your outfit! I’m loving all of the bright colors. Thanks for differentiating the different clothing items and how to wear/what they mean. I love the colors, fabrics, and patterns. Loving your outfit. Briding two different cultures are so greatful. The fabrics, patterns and how it style is so stunning. What a gorgeous outfit! It's so perfect for fall. That is an absolutely beautiful outfit! The bold colours, the fabrics, the metallic touches! They are all so rich and luxurious and highlight you so well. Wow, your outfit is so beautiful! I love all the gold in it and the red really pops! I really enjoy hearing about cultures different than my own, and am passionate about fashion as a form of expression and non-verbal communication. I really love how you tied in metaphorical aspects to your outfit, using color to symbolize the transition between Summer and Winter. Beautiful! It's a beautiful outfit. I love bright colors! It's always great to meet inspiration and make the most of your cultural heritage! The colors work perfect on you and the outfit. Glad to see that you proudly wear and share you culture heritage. You look stunning. I always love seeing these styles... especially how it's accesrrorized. That's the best part. Lovely saree.. your thought of making a bridge between Fall and Dussehra connecting the two cultures..Great ! Traditional wear was always best and its look too pretty for you. The way of blog wrting was also too nice. Interior Designing Colleges In Chennai .